The spiritual life of a St. Joseph School-Fullerton student is full. We begin and end our days with prayer. Our school community gathers each Wednesday morning with our pastor, Fr. Jesse, for morning Mass. 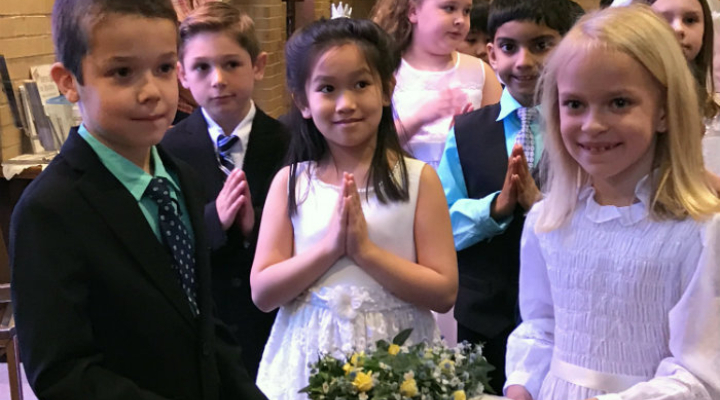 We also celebrate special Masses at Thanksgiving, St. Francis Day, Advent, Catholic Schools Week, The Feast of St. Joseph, Volunteer Day, Graduation, and on the last day of school. Numerous prayer services and student and faculty retreats are held throughout the year. A May Crowning and Living Rosary is held each spring. We hold a school-wide student retreat each spring and a faculty retreat each fall. In addition, our 8th grade students have a retreat as they prepare for their graduation and move on to their high school experiences.